Here is another fantastic issue in the UK Mythical Creatures stamp set, which I blogged about in greater detail earlier. 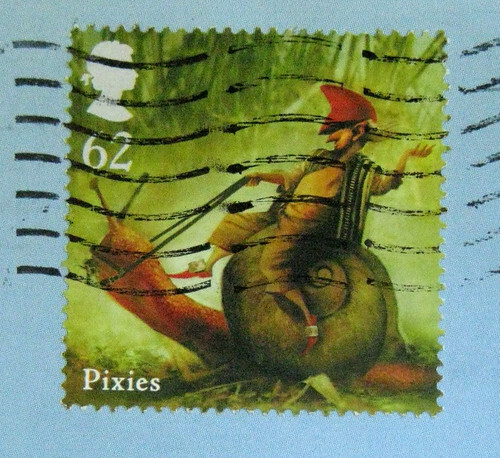 Of course I love that the pixie is riding a snail (even with a fabulous harness)... Could he be making a snail-mail delivery, perhaps? Looking at the beautiful and subtle wavy lines over the stamp makes me marvel at how much more artful UK stamp cancellations are than those in the USA. Or is the grass just greener on the other side of the pond? I got a postcard today from Honolulu with a set of wavy lines like these, about two inches long, but the edges are not as well defined. I read somewhere that the USPS has moved toward spraying the ink for cancellations instead of stamping it. I imagine that the round place/date cancellation will become a thing of the past as well; this spray-on cancellation is entirely linear as far as text. I'm thinking of applying for a mailer's postmark permit. I definately think the grass is greener on the other side of the pond . Yeah why cant we have awesome stamps like these here in the USA ? would we not appreciate them I know alot of folks dont really even look at the stamps that folks put on their envie . How sad right ? I always look at the stamp and I save it , if I like it . Yes this is an awesome stamp and would love to get one like that . For some reason the photo does not seem to be coming through. Julie - sorry about the photo! Anyone else having this problem?